Polygonia c-album, the comma, is a species of butterfly belonging to the family Nymphalidae. 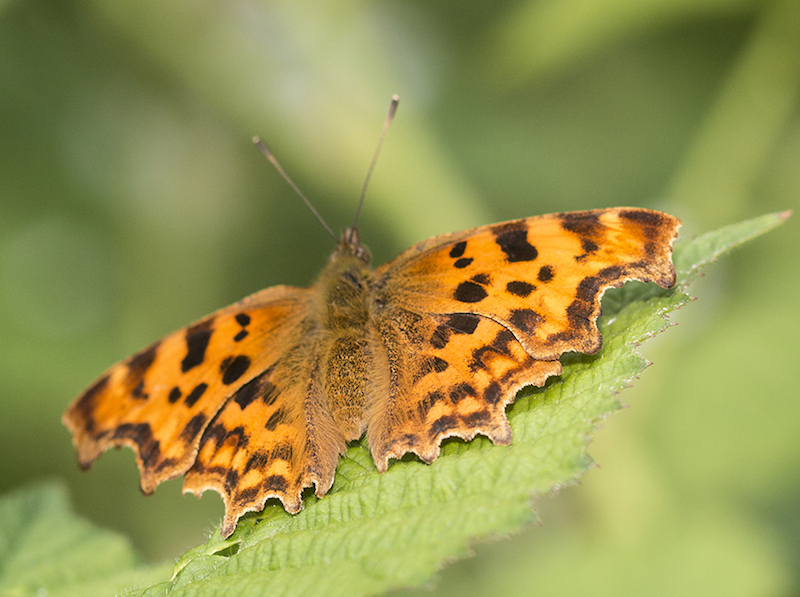 Its irregular wing edges are characteristic of the Polygonia genus, which is why they are commonly called anglewings. It is found in northern Africa and across Europe from Portugal through Asia as far as Japan. Its dorsal wings are colourful but its underside has a pattern that camouflages it when its wings are held together. Until this year I was lucky to see just one a year… this year (2017) we have already (mid-July) had any number passing through. In fact today I was admiring a red admiral on the Buddleia when a common landed next to it, closely followed by another frequent visitor this year, a hummingbird hawkmoth.